Last Saturday there was a lot a happening; markets, street carnage and more traffic. However there was one other thing going on as well. The Friends of Worcester Park Library were running a craft stall in the library. Jane and Kay (pictured) and Wendy (hiding) told me that they will be running several such stalls in the run up to this year’s now famous Christmas late night when they will be hosting a proper craft fair along with tea, coffee, juice for the little ones and cake, in the upstairs part of the library (with access from the side). The tea, coffee and juice will be FREE but the cake/biscuits will be 50p. The cakes are either made or bought by the craft girls and all donations go to "Friends of Worcester Park Library". They will actually be running the craft stall on both the Friday evening from 6-8pm and also on the Saturday from 11am-3pm. 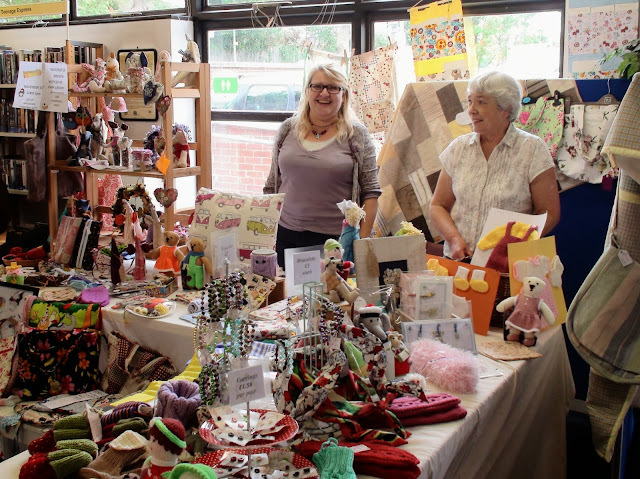 The girls are planning to run these craft stalls in the library in order to bring the public’s attention to the Friends of Worcester Park Library, what they do there and what is available. The actual Christmas Late Night evening will be on Friday the 6th December this year. There will be more information to follow but put it in your diary now! That means the Library craft fair will be on Friday the 6th and Saturday the 7th of December.